is what I am portraying from this piece. 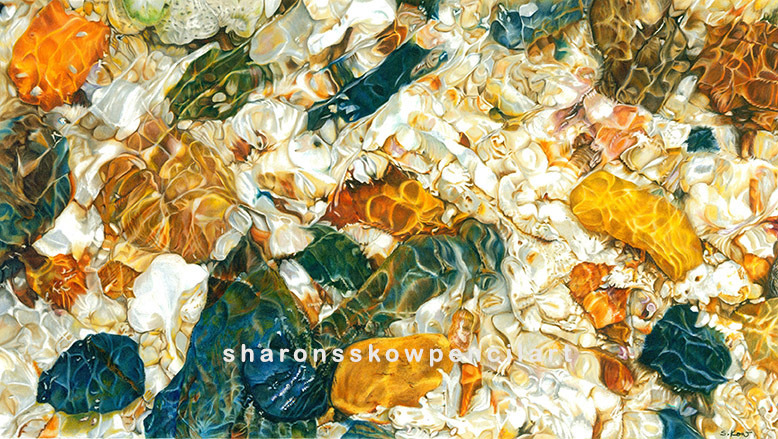 I was fascinated by rock pebbles after my previous piece, Stillness Speaks. I find doing rock pebbles calms me. It gave me freedom to play with textures and colours. Rocks pebbles are not rigid in forms and textures, there is no definite definitions to paint a rock, I just let my eyes and hand do the work. Here is the reference photo that I took during my short holiday break in the island of Langkawi. I was skimming by the beach, looking for inspiration when I happened to look down and saw these beauties. It was on very shallow water surrounded by huge rocks. Immediately, I know what my next painting will be. The ripples of the flowing water makes everything look so serene.